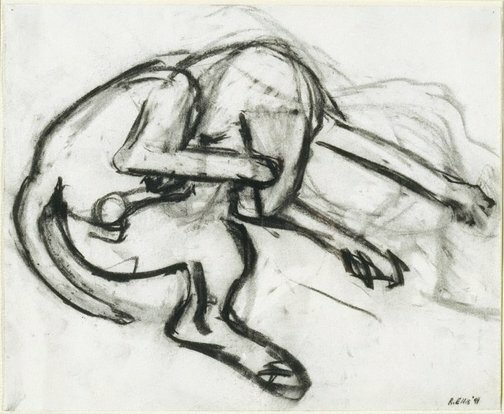 Signed and dated l.r., charcoal "R.Ellis 91". Hendrik Kolenberg, Contemporary Australian Drawing: 20 years of the Dobell Prize for Drawing , ‘Introduction’, pg. 6-14, Sydney, 2012, 10, 64 (illus. ), 74. Hendrik Kolenberg, Look , 'Drawing a winner: a decade of Dobell prizes shows us how and why', pg. 24-27, Sydney, Aug 2003, 24, 25 (illus.). Hendrik Kolenberg, Look , 'A fine harvest of drawings: legacy of an exeptional draughtsman', pg. 28-31, Sydney, Nov 2011, 29 (illus.). Anne Ryan, Look , 'Drawing it all together', pg. 28-29, Heidelberg, Dec 1997, 29 (illus. ).